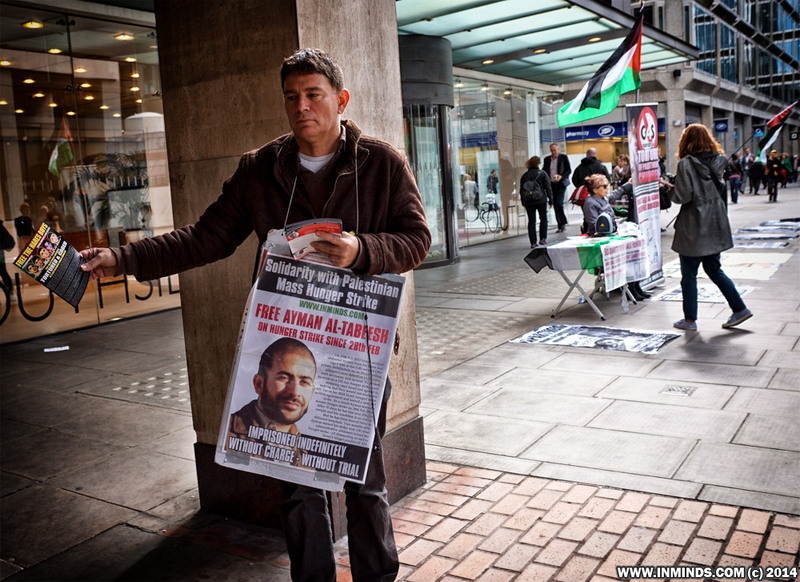 On 17th Feb 2013 Israeli soldiers abducted 33 years old Ayman Al-Tabeesh from his home in Dura, near al-Khalil, and caged him at the G4S secured Ofer prison - indefinitely on an illegal rolling administrative detention order with no charge, and no trial. 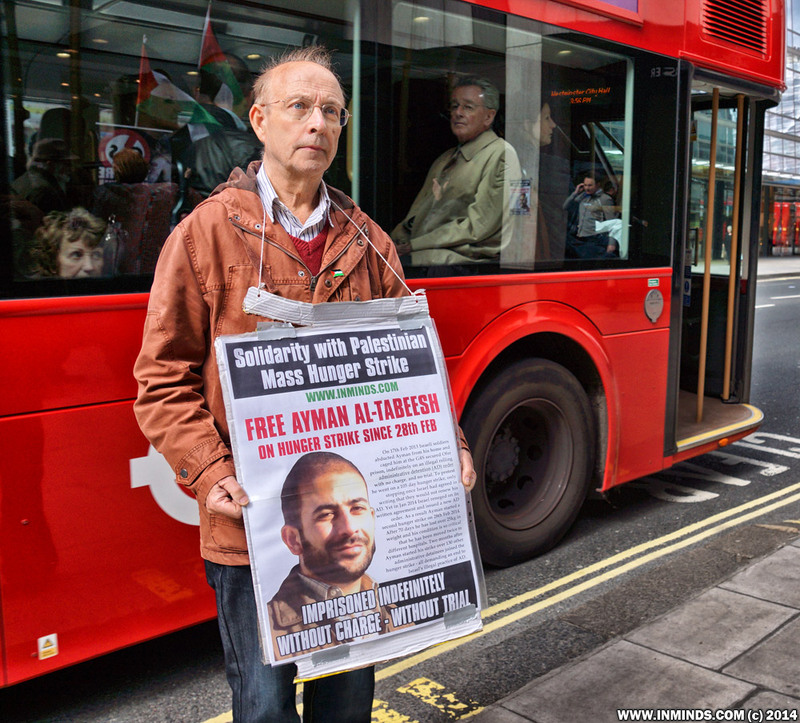 To protest he went on a 105 day hunger strike, only stopping once Israel had agreed in writing that they would not renew his administrative detention. 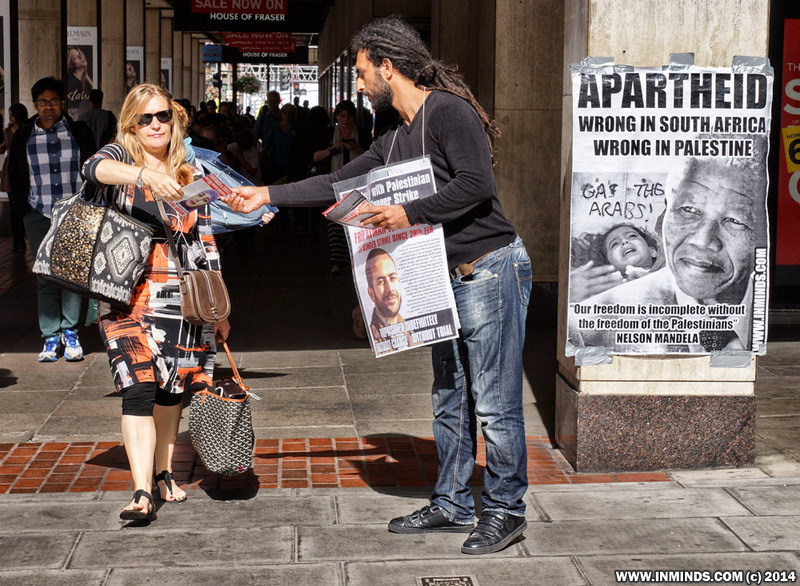 Yet in Jan 2014 Israel reneged on its written agreement and issued a new administrative detention order. 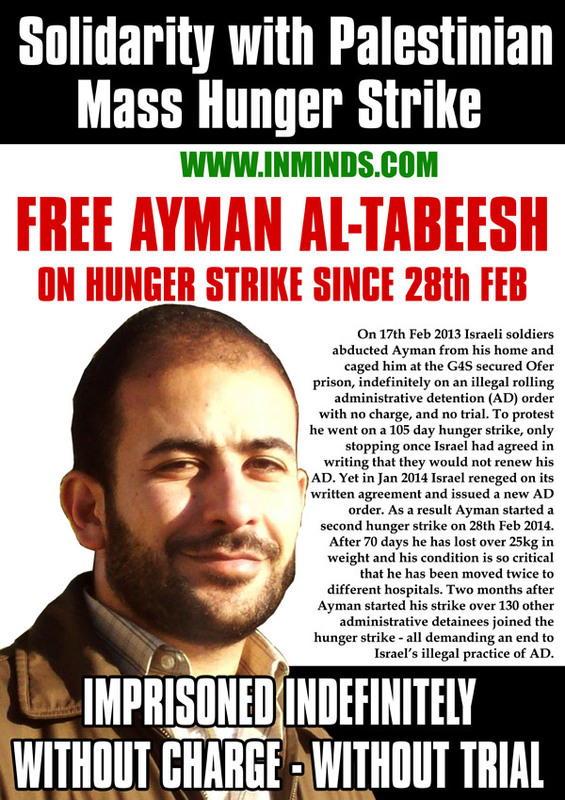 As a result Ayman started a second hunger strike on 28th Feb 2014. After 70 days he has lost over 25kg in weight and his condition is so critical that he has been moved twice to different hospitals. 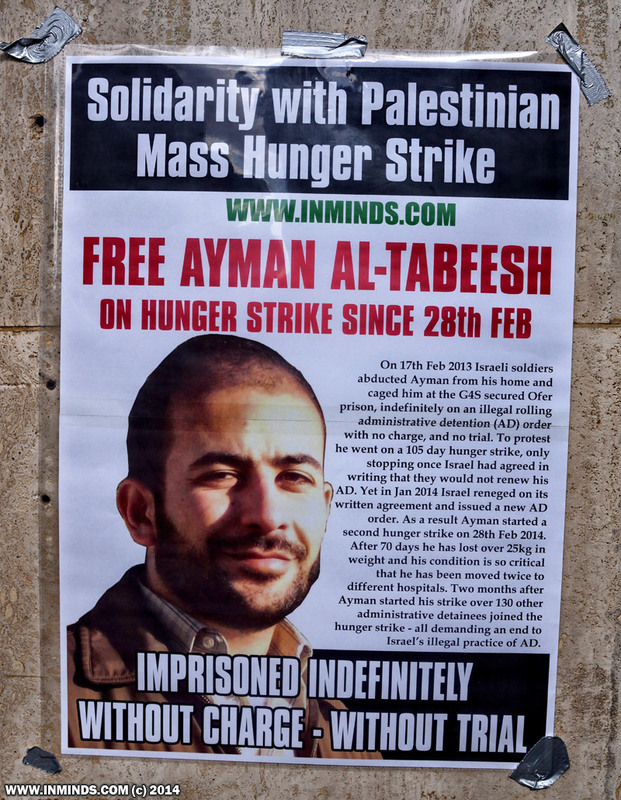 Two months after Ayman started his strike over 130 other administrative detainees joined the hunger strike - all demanding an end to Israel’s illegal practice of administrative detention. 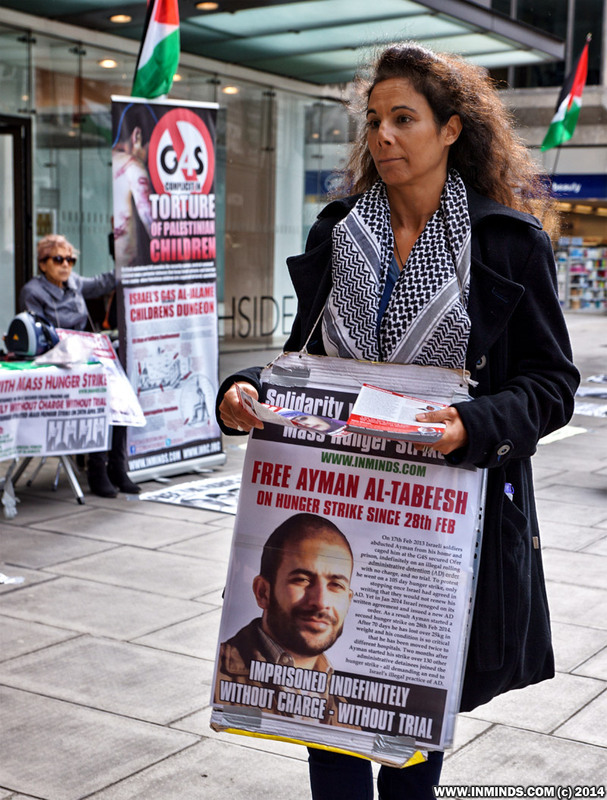 "Thank you for standing besides us in supporting the steadfastness of my brother Ayman Al-Tabeesh in his hunger strike. 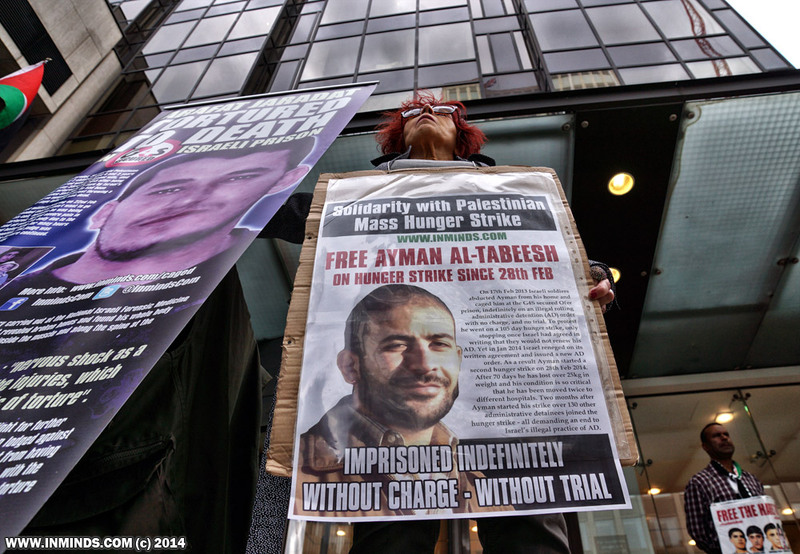 Thank you for your humanity in supporting the Palestinian prisoners, especially the hunger strikers. We need you to tell the international community of Israel's criminal brutality against our prisoners, the violation of their rights. The occupations illegal never ending administrative detention orders is nothing less than a slow death for Palestinian prisoners." Administrative detention is often used to arbitrarily jail Palestinians where there is no evidence for a trial, or for punishment as in the case of 9 Palestinian MPs. Israel has on average issued over 2000 detention orders every year (2007-2011). Today there are 186 administrative detainees, the vast majority - 86% are locked up in G4S secured prisons, most of them having been transferred from the West Bank into Israel in contravention of Article 76 of the Fourth Geneva Convention. 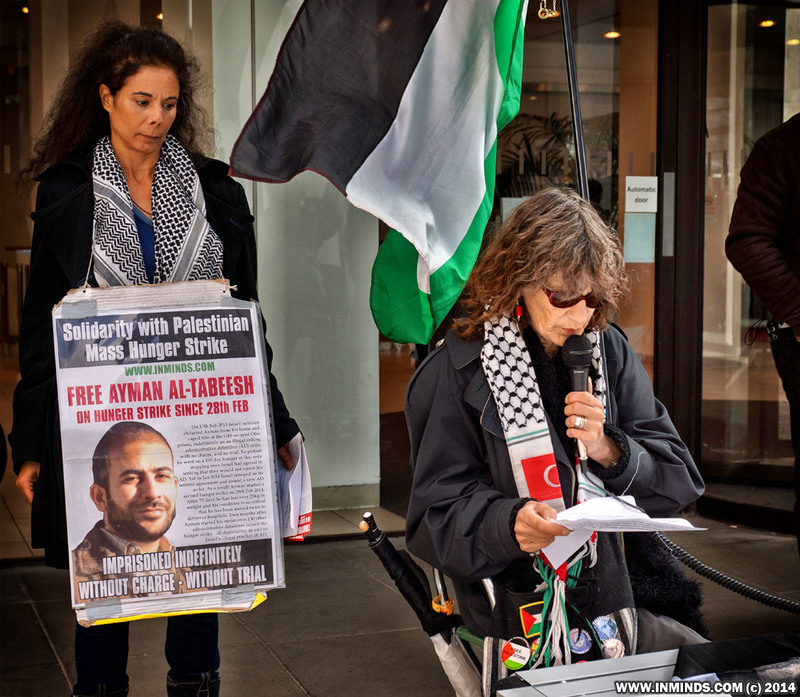 To protest Israel's illegal system of administrative detention Palestinian administrative detainees launched a mass hunger strike 16 days ago on 24th April 2014. On the first day 130 prisoners joined the strike. We are here today to show our solidarity with their hunger strike and demand the British security company G4S stop its complicity in Israels war crimes against Palestinian prisoners! 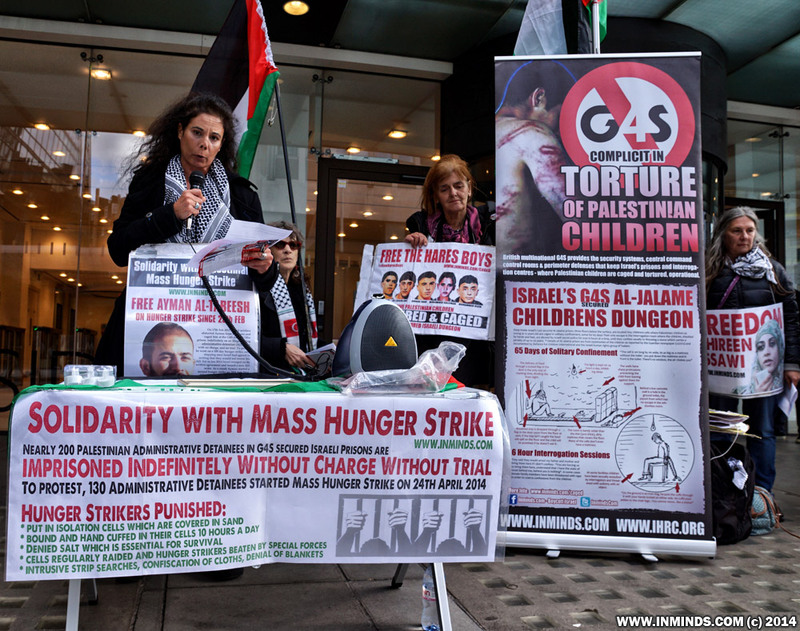 On April 24th Palestinian administrative detainees who are imprisoned illegally for an indefinitely period of time, without a charge, and without a trial, by Israel in G4S secured dungeons, started a mass hunger in protest. On the first day 130 prisoners joined the strike. This is a letter from those striking prisoners. It was written on the sixth day of their hunger strike which started 16 days ago. On this great day in which deeds are raised to Allah, we write to you whilst the hunger is devouring our bodies, but we look at each other with new dignity and respect, challenge and determination. Our bodies are weak but our spirit is strong and soaring high in peace with faith in Allah. 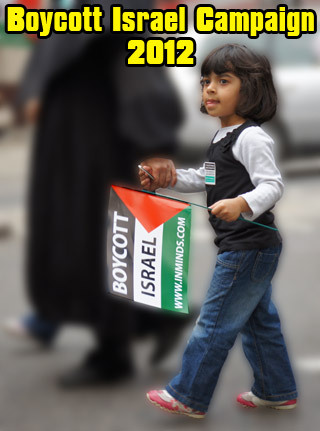 We are the owners of right and justice whilst our enemy Israel is an unjust aggressor. It is true that Israel has the power of oppression, but we have the will, the steadfastness and the determination to see victory. We will make them recognize that our empty stomachs are stronger than their oppression and prison walls. After we started our open hunger strike on 24th April 2014, protesting the continuation of our unjust administrative detention, without charge, trial or reason; demanding our freedom to return to our families, our wives, our children, we have been brutally attacked by the prison forces. They are trying to break our will and steadfastness. 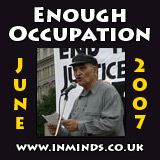 They have isolated us in Ayalon Prison and Ramleh Prison and sections of the Negev which are so filthy and corroded. They have put all the hunger strikers in solitary confinement as collective punishment and banned family visits for many months. Our hands and feet have been shackled and our cloths stripped from us for many hours before being forced to wear 'Shabas' rags. They have stopped delivery of promised blankets for the cold desert nights. The cold is gnawing at our bones. We suffer brutal strip searches everyday by the special forces whose sole task is repression and humiliation. They keep us in the burning sun all day, and without blankets all night in the bitter cold. We wake to their taunts: Where are the Arabs? Where are the Muslims? Where is humanity? No one hears your voice, no one is supporting you, you are alone! We respond to them that God is with us and you will soon see the solidarity of the Arabs, the Muslims and humanity. We promise you that their oppression, their terrorism, will never break our will and determination; our strong faith in Allah, belief in our just cause and our confidence in humanity standing by our side in this fierce battle for freedom, and we confirm that we will continue our open hunger strike until freedom is won. We call on our people, and on all people who value freedom, to protest in the streets and public squares, to erect freedom tents in every city of our beloved Palestine, in front of embassies and consulates. After God, we draw our strength from your support. We call on human rights organisations and the ministry of detainees to send lawyers to visit us immediately. We have not received any visits, even the Red Cross. We appeal to everyone to act before its too late. 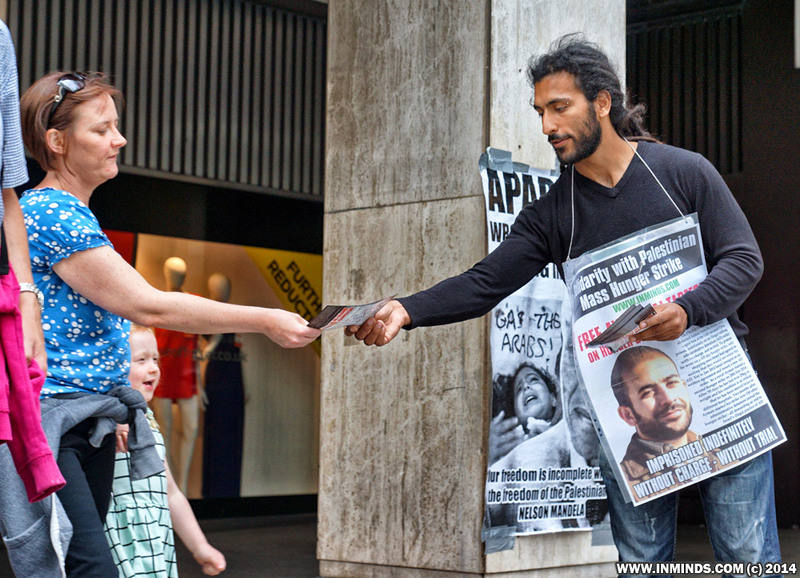 We thank all who stand by our side in this battle for humanity, freedom and justice. We ask you to expand your actions and together we will defeat the oppressors by our strong will and empty stomachs and God willing victory will be achieved soon. Ayman Al-Tabeesh, former administrative detainee and long-term hunger striker, was released from Israeli occupation prisons after 30 months of imprisonment without charge or trial on Thursday, 1 October. He returned to his family in Dura village near al-Khalil. 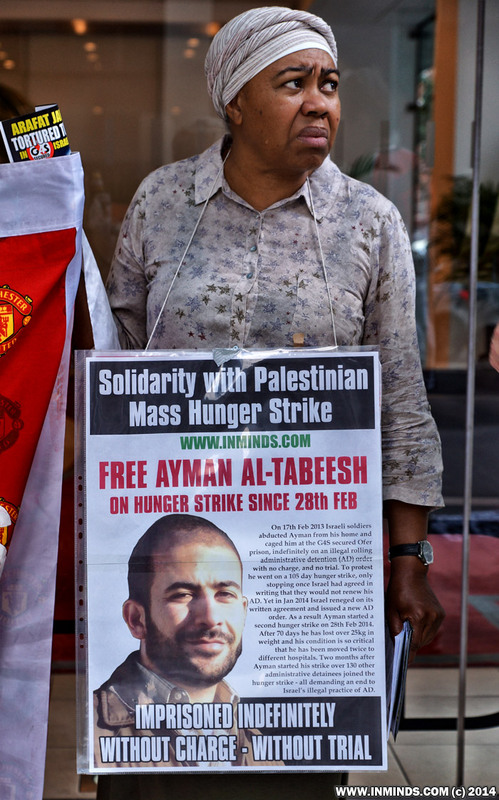 Al-Tabeesh, 35, went on hunger strike five times. He was repeatedly promised release at the end of his detention period, only to have his detention renewed again without trial on the basis of secret evidence. He has been imprisoned for a total of 11 years over multiple arrests. He launched a hunger strike on 23 May 2013, protesting his detention without charge or trial following his arrest on 9 May. After 105 days, he suspended his strike after a promise to not renew his detention. However, after the renewal of his detention in violation of the agreement, he launched a hunger strike on 28 February 2014, which ended on 30 June 2014, with an agreement for his release on 5 January 2015. Again, the occupation reneged on the agreement, extending his detention. He has been participating in the boycott of the military courts by administrative detainees, held without charge or trial. 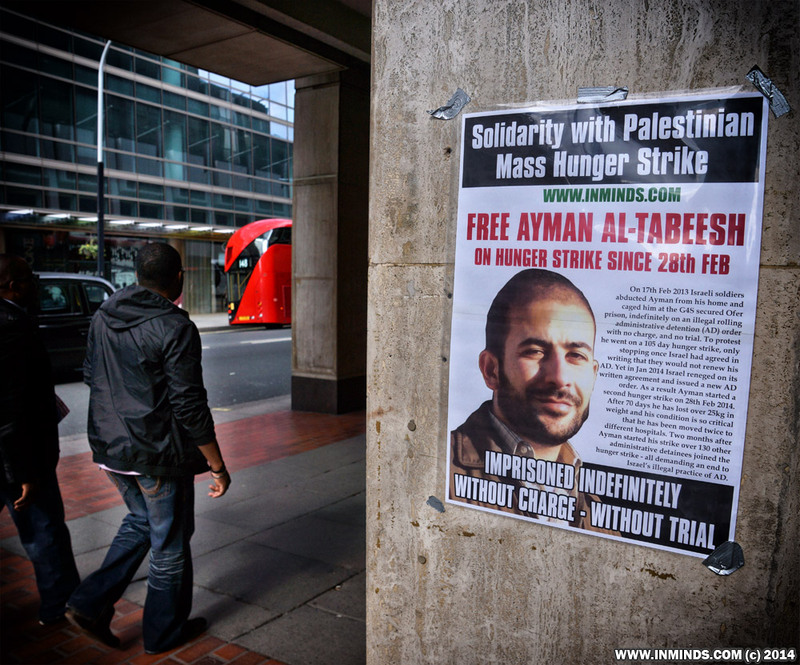 During a previous imprisonment in 2012, he also participated in the collective Karameh hunger strike with thousands of Palestinian prisoners, as well as solidarity strikes with Khader Adnan and Hana Shalabi.